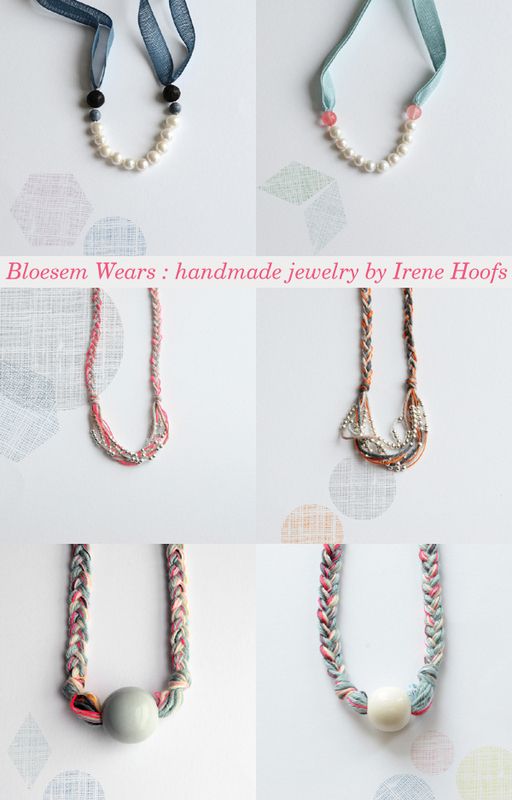 Yesterday the lovely Irene Hoofs, founder and editor of Bloesem, launched her new range of incredibly pretty and tactile, limited edition handmade jewelry. I was instantly smitten with these gorgeous pieces from her ladies collection (there's also a range of childrens pieces here) including her take on the classic string of pearls which you can read more about here. Of course the braided yarn pieces are the ones totally grabbing my attention as you might imagine. 'Liv in Silver' is just so pretty! Of course I'm also loving the colours Irene has picked out for these neclackes - those soft greys, duck egg blues and beige speckled with flashes of gorgeous neon pink and orange. Love! Oh, and if you fancy having a wee go at making your own Liv necklace (pictured in the middle row) Irene has created two DIY kits for you, one in gold and one in silver... yay! These necklaces are so sweet. The colors and their harmony are wonderful. So pretty - I'm a little bit in love with Orla myself.